If you like quick and easy, bright and cheery, and “summery” looking cards, don’t miss out on the Retiring Stamp Set Pop of Paradise. This card uses simple stamping techniques and comes together in no time! Today, I am re-posting a card from a couple of years ago that used the Pop of Paradise set. Don’t you just love how the background came out on this one? Pick a stamp and then stamp that same image over and over onto your card panel. See? Simple Stamping! The Gorgeous Grunge stamp set was also used on this card and even though that set is no longer available I know that most of you have it! If you don’t have it then look at the stamp sets you currently have. There are many sets that have the “speckle” type image that you can use. Otherwise, keep the speckles off and it will still look great. Don’t forget to stamp the inside panel of your card! You can keep it simple and still have a great look. Want to see a few more simply stamped cards using the Pop of Paradise set? Here are a few that I had previously shared. 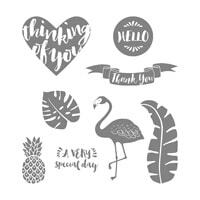 Get the Pop of Paradise Stamp Set Today before it’s gone forever! I love to watch your tutorials. I also live in Michigan only in the thumb. Hope you have a good week.